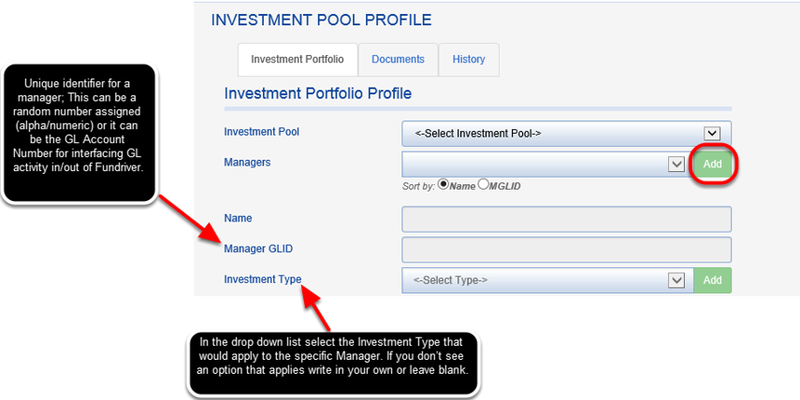 The screen shots below will define for the user the fields in the ORGANIZE > INVESTMENT POOL section of Fundriver. This section is only available to those clients that subscribe to the Investment Portfolio Module and enter investment activity by manager vs. by investment pool. 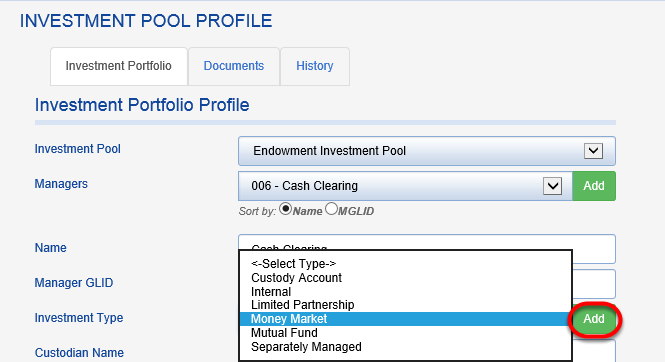 The INVESTMENT POOL PROFILE can be found in ORGANIZE > INVESTMENT PORTFOLIO on the INVESTMENT PORTFOLIO tab. Adding a new manager is done by clicking the green ADD button. Please see screen shot below for field definitions to help you fill out the profile. The standard INVESTMENT TYPES are shown below. You can add to this list by clicking the green ADD button next to INVESTMENT TYPE. Fill in the fields based on the following field definitions. Drop down from ASSET CLASS table. The INITIAL CAPITAL COMMITMENT fields should contain the full capital commitment amount.The COMMITMENT ADJUSTMENTS should reflect any adjustments made since the initial commitment. 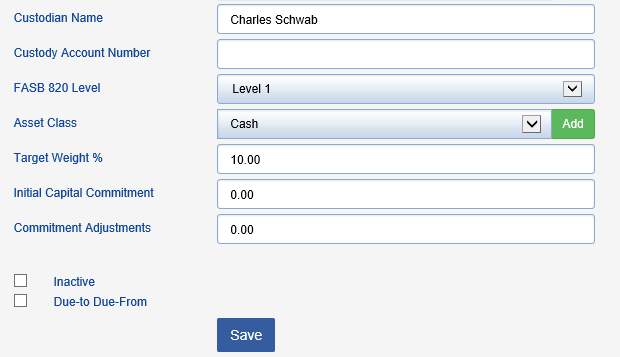 That field will also populate automatically when investment manager activity is entered. Definition of Capital Commitment: A contractual agreement between an investor and a venture-capital fund that obligates the investor to contribute money to the fund. The investor may pay all of the committed capital at one time, or make contributions over a period of time. This often takes place over a number of years. Commitment Adjustments are any payments or changes made beyond the initial commitment amount. 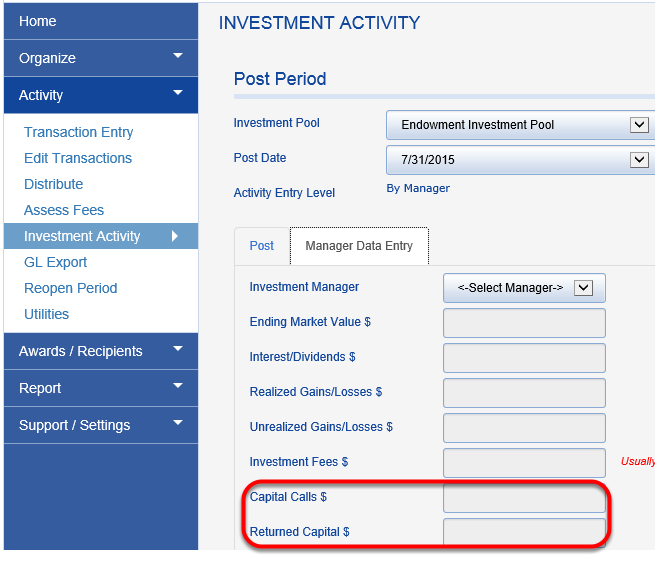 Adjustments are made through entry to the CAPITAL CALLS and RETURNED CAPITAL fields of the INVESTMENT ACTIVITY > MANAGER DATA ENTRY screen, shown below. How do I post and reconcile investment activity? How do I update Manager GLIDs that have changed?